The power sport OEM recommended load tester, power desulphator, charger for all types of small engine 12V lead-acid batteries. BatteryMate has been saving batteries for 25 years! Quick new battery activation – 30 minute activation charge for new batteries that have received acid just prior to charging, such as STD flooded batteries with removable filler caps and AGM-MF ‘dry-charged’ batteries that are delivered with a separate custom acid pack. 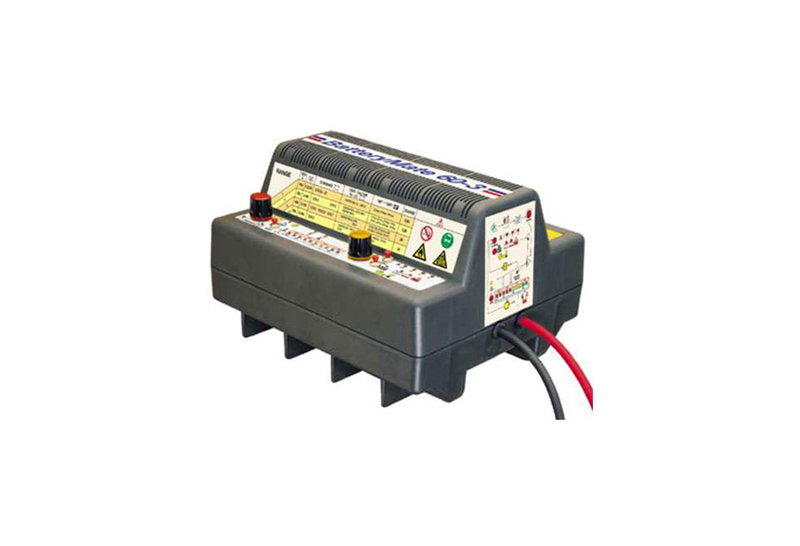 True load tester selectable from 10A to 60A – Automatically tests battery cranking amps up to 120CCA. 3 second test simulates normal engine cranking / start. Powersport specific charging algorithm – 4 step charging method recovers any 12V battery. MF mode allows up to 16.9V for ‘dry-charged’ AGM batteries. Temperature regulated charging – Charge voltage is adjusted according to ambient temperature. (-4mV/°C/cell above/below 68°F/20°C). Accurate voltage sensing – Charge leads have integrated voltage sense wires for exact voltage measurement at the battery. Easy to use – 4 position combination selector allows selection of correct test and charge current for connected battery. TEST and then select max. charge time according to result, press CHARGE button. Program completes charging automatically and then tests the battery. CHARGING AMPS : 3.2A maximum; 0.8 – 3.2 Amp selection. TESTING AMPS : 60A maximum; 10 – 60 Amp selection. USE : Indoor / workshop environment (lowest temperature: -4°F / -20°C). SAVE : Low Volt Start of 1V + high power desulphation recovery. IDEAL FOR : STD, AGM & GEL 12V batteries from 2 – 12Ah. INPUT : Selectable 110-120VAC / 220-240VAC 50-60Hz, with ON/OFF power switch and replaceable fuse protection. STYLE : Vented industrial table top case with wall mount option (TS-218), 6ft / 180cm AC supply lead and 1 pair high current 6ft / 180cm charge leads ending in heavy duty battery clamps. SAFE: No risk of overcharging. Sparks suppressed. Safe for long-term battery maintenance. Automatic shut-down if short-circuited or battery disconnected. 2-year warranty.